02/21/2019 · McWane, Inc.And the winners of the 2018 McWane EHS Awards are . . .
10/23/2018 · McWane, Inc.We’re Number One! 08/06/2018 · McWane DuctileWhich national park is the least visited in the nation? 07/26/2018 · Clow ValveHow do you beat the summer heat? 07/12/2018 · McWane DuctileWho doesn’t want to lose a few pounds? 07/10/2018 · Clow ValveWhat do you do at work dad? 05/30/2018 · McWane, Inc.“There’s Quality (and apparently dry ice) Behind The Diamond”! 02/15/2018 · McWane, Inc.And the winners of the 2017 McWane EHS Awards are . . .
01/15/2018 · AB&I FoundryAB&I team celebrates Dr. Martin Luther King, Jr.
01/08/2018 · Tyler PipeDo you recognize this runner? 12/12/2017 · Manchester TankAnd the person with the tackiest sweater is . . .
12/06/2017 · McWane, Inc.Who has the ugliest Christmas sweater? 08/21/2017 · McWane, Inc.Did you get to see the solar eclipse? 08/08/2017 · Manchester TankWhat could you build with spaghetti, tape, twine and a marshmallow? 07/11/2017 · Tyler CouplingWhat would summer be without a trip to the ballpark? 07/06/2017 · Kennedy Valve Co.Did you know that fire hydrants come in lots of colors? 07/03/2017 · Tyler PipeAnyone up for a game of putt putt golf? 05/15/2017 · McWane, Inc.Did you know this week is Infrastructure Week in the U.S.
05/04/2017 · Tyler PipeWhere would we be without those amazing teachers? 04/03/2017 · McWane, Inc.Anyone up for fishing? 03/22/2017 · McWane, Inc.Did you know today is World Water Day? 01/19/2017 · McWane, Inc.And the winners of the 2016 McWane Health & Safety Awards are . . .
08/23/2016 · Tyler PipeAnyone up for Zumba? 08/23/2016 · McWane, Inc.Could you ride a bicycle for 420 miles? 07/26/2016 · Manchester TankHow do you dispose of your old computers, printers and gaming devices? 07/14/2016 · Clow CanadaHave you ever tried to play golf with one hand tied behind your back? 06/14/2016 · Tyler CouplingWhen’s the last time you went to a baseball game? 06/07/2016 · Manchester TankEver wonder what 998 years of tank experience looks like? 01/05/2016 · McWane, Inc.McWane welcomes Cory Zwolinski to the International Trade Compliance Team! 09/30/2015 · McWane, Inc.Introducing the winners of this year’s McWane’s Got Talent Contest! 09/17/2015 · McWane, Inc.McWane Ductile-Utah Recertified as OSHA VPP Star Site! 09/14/2015 · McWane, Inc.Do you Feel like a Million? 09/08/2015 · McWane, Inc.McWane for Generations! 09/08/2015 · McWane, Inc.Anyone up for a Mocktail? 08/24/2015 · McWane, Inc.Tyler Team Copes with Record Setting Heat! 08/20/2015 · McWane, Inc.Creative Ways to Beat the Heat in Tyler, Texas! 08/18/2015 · McWane, Inc.A little bit of AB&I “elbow grease” goes a long way at local elementary school! 08/13/2015 · McWane, Inc.Have you ever seen an Amerex Minion? 08/10/2015 · McWane, Inc.You’re Never too Old to Enjoy a Nice Cold Root Beer Float! 08/03/2015 · McWane, Inc.Guess where McWane products were sighted now? 07/30/2015 · McWane, Inc.Guess who’s looking for McWane products now? 07/30/2015 · McWane, Inc.Have you ever been in a Seed Spittin’ Contest? 07/20/2015 · McWane, Inc.And the Winners of the June 2015 EHS/HR Awareness Post Contest Are . . .
07/20/2015 · McWane, Inc.Who Says Ductile Iron Pipe Isn’t Beautiful? 07/06/2015 · McWane, Inc.Check Out This Product Sighting! 07/06/2015 · McWane, Inc.Did you know that stretching can prevent repetitive motion injuries? 06/25/2015 · McWane, Inc.What do you live for? 06/25/2015 · McWane, Inc.Anyone up for bowling? 06/25/2015 · McWane, Inc.Do you know what to do in the event of an emergency? 06/17/2015 · McWane, Inc.Manchester Tank Bedford Team Asks the Question: What Do I Live For? 06/10/2015 · McWane, Inc.Can you imagine your life without a hand or an eye? 05/11/2015 · McWane, Inc.Stop by and pay us a visit on social media! 05/04/2015 · McWane, Inc.Stop by and pay us a visit on social media! 03/24/2015 · McWane, Inc.We've Done it Again! 03/02/2015 · McWane, Inc.Kennedy Valve Makes Their Biggest Gate Valve Yet! 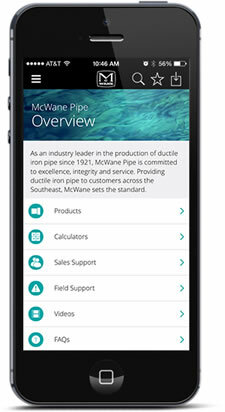 02/26/2015 · McWane, Inc.Congratulations to the McWane Ductile Utah Maintenance Department! 01/08/2015 · McWane, Inc.AB&I Team Member Spots AB&I Pipe at Alcatraz! 12/30/2014 · McWane, Inc.What do these 15 team members all have in common? 12/18/2014 · McWane, Inc.Michael Maziarz Awarded Bronze Star! 12/16/2014 · McWane, Inc.M&H Valve Sponsors "Christmas Evening on Noble Street"
11/17/2014 · McWane, Inc.Manchester Tank Quincy Celebrates Ergo Cup Win and Team Service! 11/03/2014 · McWane, Inc.Aaron Loosli Spots our Products in Yellowstone National Park! 10/22/2014 · McWane, Inc.Tyler Pipe Think Pink Day! 08/04/2014 · McWane, Inc.TAG . . . You’re it! 08/04/2014 · McWane, Inc.Take me out to the ballgame! 06/23/2014 · McWane, Inc.Clow Valve Machine Shop Celebrates Injury Free First Quarter! 03/27/2014 · McWane, Inc.Manchester Tank Elkhart Wins 2014 Ergo Cup! 02/04/2014 · McWane, Inc.McWane, Inc. Acquires Zinwave Ltd.
10/21/2013 · McWane, Inc.Tyler Pipe Holds "Pink Out Day"
10/02/2013 · McWane, Inc.Tyler Pipe Customer Service Has a New Workspace! 08/06/2013 · McWane, Inc.Clow Water Passes OSHA 3-Year VPP Recertification! 06/17/2013 · McWane, Inc.Are our children prepared to act in an emergency? 04/23/2013 · McWane, Inc.Freshwater Land Trust Presents Plaque of Appreciation to McWane, Inc.